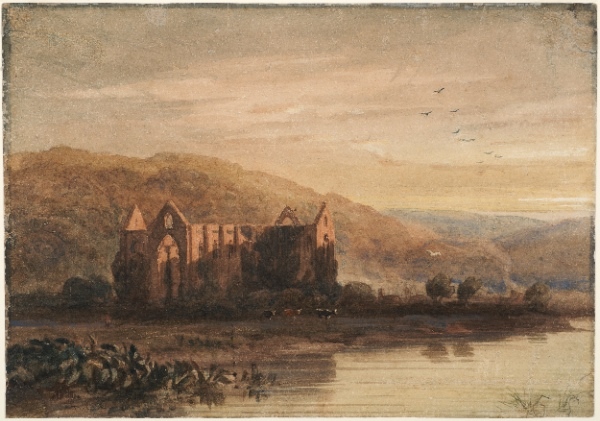 Summary: View across the river to Tintern Abbey, there are some cattle in the foreground. Description: The artist David Cox was born in Heath Mill Lane, Deritend, Birmingham on 29 April 1783. He was apprenticed aged fifteen to a miniature painter called Fieldler but the following year was engaged as an assistant to a theatre scene-painter. In 1804 he became scene-painter for Astley's Theatre and moved to London. In London, he abandoned scene-painting for fine art and took lessons with John Varley. He initially concentrated on watercolour painting and was an outstanding exponent of the medium until his death. In 1809 his wife Mary had a son, David Cox Junior, who followed his father's career as an artist. By 1810 Cox's reputation was such that he became President of the Associated Artists in Water Colour. 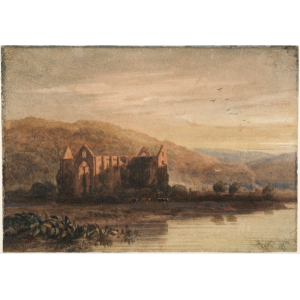 Cox was a leading watercolourist during an age of particular excellence in watercolour art. His works vary from modest views of rural life to large watercolours designed for exhibition such as Carthage: Aeneas and Achates (1825). Later, Cox painted with looser brush strokes eloquently capturing the wilder qualities of Welsh views or a squally sky. A good example of the blustery effects Cox achieved can be seen in his watercolour Penmaen Bach. Cox pioneered the use of Scottish wrapping paper, also known as Cox paper, which has a coarse texture with imperfections. The paper contributed to the rough textures of his late work. When asked what he did about brown marks in the paper when he was painting skies, Cox replied that he turned them into birds! Cox lived in Hereford and London from 1817 to 1840 continuing to visit Birmingham and exhibiting at the Birmingham Society of Artists. In 1841 he moved to Greenfield House, Greenfield Road, Harborne, Birmingham. During the 1840s Cox continued to visit Wales, staying at Bettws-y-Coed. He was not the first Birmingham artist to travel to Wales but his example certainly encouraged the next generation to continue the tradition. Cox took to oil painting comparatively late, taking lessons from W. J. Mller in 1839. Among his most famous oil paintings are The Welsh Funeral and Rhyl Sands.